Further to my previous post about After the Funeral, I would like to add some additional comments below, at ‘my take’, and to upgrade my rating to A+. HarperCollins, 2010. Format: Kindle edition. File size: 1009 KB. Print length: 307 pages. ISBN: 978-0-00-742212-8. ASIN: B0046A9N2Q. First published in the US by Dodd, Mead and Company in March 1953 under the title Funerals are Fatal and in the UK by the Collins Crime Club on 18 May of the same year under Christie’s original title. With an Introduction by Sophie Hannah. First paragraph: Old Lanscombe moved totteringly from room to room, pulling up the blinds. Now and then he peered with screwed up rheumy eyes through the windows. Synopsis: The master of a Victorian mansion dies suddenly – and his sister is convinced it was murder…. When Cora is savagely murdered with a hatchet, the extraordinary remark she made the previous day at her brother Richard’s funeral suddenly takes on a chilling significance. At the reading of Richard’s will, Cora was clearly heard to say: ‘It’s been hushed up very nicely, hasn’t it…But he was murdered, wasn’t he?’ In desperation, the family solicitor turns to Hercule Poirot to unravel the mystery. 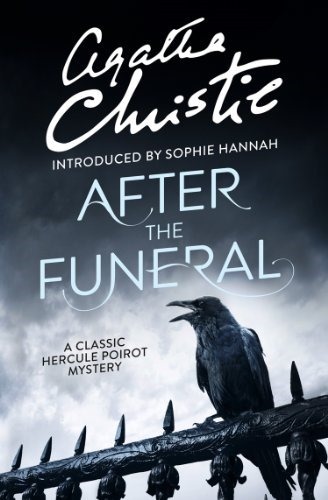 More about this story: Classic Agatha Christie themes are evident in After the Funeral – a healthy inheritance casts suspicion on the family, but as ever, nothing is quite as it seems. The story was first published in the US, titled Funerals are Fatal, two months before it was published in the UK. It was first adapted for film in 1963 and starred Margaret Rutherford. It was titled Murder at the Gallop and replaced the character of Poirot with Miss Marple, changes which Agatha Christie was less than keen on. More faithful adaptations were made long after Christie was around to see them. In 2005 the story was adapted for BBC Radio 4 with a full cast; John Moffatt was Poirot. And in 2006, the story became an episode in the long-running series Agatha Christie’s Poirot, with David Suchet in the lead role. This episode also featured the acting talents of Lucy Punch (as Susan) and Michael Fassbender (as George). My take: Despite his age Mr Entwhistle, as executor of Richard Abernethie’s last will of whom he was a personal friend, does not hesitate to make a long and uncomfortable ride to attend his funeral. Neither one of his close relatives really felt any deep grief for his death, indeed none had close ties with him. Following the funeral, the family gather for a brief reading of his testament. The bulk of his large fortune is to be divided into six equal portions. Four of these are to go to his brother Timothy; his nephew George Crossfield; his niece Susan Banks, and his niece Rosamund Shane. The other two portions are to be held upon trust and the income from them paid to Mrs Helen Abernethie, the widow of his brother Leo; and to his sister Mrs Cora Lansquenet, during their lifetime. The capital after their death to be divided between the other four beneficiaries or their issue. The surprise arises when her sister Cora Lansquenet exclaims: ‘But he was murdered, wasn’t he?’ The elderly lawyer Mr Entwhistle will keep on thinking over and over again on this sentence. And the next day, his surprise will be huge when receiving a phone call from the police to inform him Clara has been found dead, brutally murdered. Afraid that both deaths could have been somehow related, Mr Entwhistle doesn’t hesitate to call upon his old friend Hercule Poirot to ask him for his opinion. And Poirot, encouraged by this challenge that’s been put before him, accepts with pleasure to get involved himself in the issue. The story, narrated at a nice pace, turns out being highly entertaining, with characters properly drawn and a rather unexpected denouement. In fact, Sophie Hannah states at the Introduction: ‘After the Funeral has a brilliant plot, meticulously planted clues, a memorably dysfunctional family at its centre, and a truly ingenious solution, …’ It might be added to all this that the story has a perfect structure and that, as usual, Agatha Christie has the talent to misdirect her readers’ attention, with red herrings, while, at the same time, playing fair by providing all the necessary information to solve the case. It’s also worth mentioning the story gathers the social an economic changes that were ongoing in England in the post-war period. With all this, I sincerely believe I rushed in my previous assessment of this book and, after reflecting about it, I’ve no doubt in insistently recommend it as one of Poirot’s best novels. After the Funeral has been reviewed at BooksPlease, Mysteries in Paradise, Mystery File, among others. Primer párrafo: El viejo Lanscombe se movía tambaleándose de habitación en habitación, levantando las persianas. De vez en cuando, con ojos llorosos y entrecerrados, miraba a través de las ventanas. Sinopsis: Un anciano millonario, muere inesperadamente y sus descendientes esperan ansiosos la lectura del testamento para solucionar sus respectivos problemas económicos. Sin embargo las cosas se complican cuando su hermana deja entrever imprudentemente que posiblemente su hermano fue asesinado y, ella misma. muere violentamente asesinada al día siguiente de haber realizado ese poco afortunado comentario. El abogado de la familia se dirige a su viejo amigo: Hércules Poirot, para desentrañar el misterio y descubrir la identidad del asesino. Más sobre esta historia: Los temas clásicos de Agatha Christie son evidentes en Después del funeral, una herencia sustanciosa genera sospechas en la familia, pero como siempre, nada es lo que parece. La historia se publicó originalmente en los Estados Unidos, con el título de Los funerales son mortales(Funerals are Fatal), dos meses antes de su publicación en el Reino Unido. La novela fue adaptada al cine por primera vez en 1963. Protagonizada por Margaret Rutherford, llevaba como título Detective con faldas (Murder at the Gallop) y en la película se había sustituido el personaje de Poirot por el de Miss Marple, cambios con los que Agatha Christie no estaba de acuerdo. Mucho después de que Christie pudiera verlos se hicieron adaptaciones más fieles. En el 2005, la historia, adaptada por la BBC Radio 4 con un elenco completo, tenía a John Moffatt como Poirot. Y en el 2006, la historia se convirtió en un episodio de la extensa serie de Agatha Christie, Poirot, con David Suchet en el papel principal. Este episodio también contó con el talento escénico de Lucy Punch (en el papel de Susan) y de Michael Fassbender (como George). Mi opinión: A pesar de su edad, el señor Entwhistle, como albacea del testamento de Richard Abernethie, de quien era un amigo personal, no duda en hacer un largo e incómodo viaje para asistir a su funeral. Ninguno de sus parientes cercanos realmente sintió un profundo dolor por su muerte, de hecho, ninguno tenía vínculos estrechos con él. Después del funeral, la familia se reúne para una breve lectura de su testamento. El grueso de su gran fortuna se dividirá en seis porciones iguales. Cuatro de estas irán a parar a su hermano Timothy; su sobrino George Crossfield; su sobrina Susan Banks y su sobrina Rosamund Shane. Las otras dos partes se constituiran como fideicomiso y sus rentas se pagarán a la señora Helen Abernethie, la viuda de su hermano Leo; y a su hermana, la señora Cora Lansquenet, de por vida. El capital tras su fallecimiento se dividirá entre los otros cuatro beneficiarios o su descendencia. La sorpresa surge cuando su hermana Cora Lansquenet exclama: “Pero fue asesinado, ¿no es verdad?” El anciano abogado Sr. Entwhistle seguirá dándole vueltas una y otra vez a esta frase. Y al día siguiente, su sorpresa será enorme al recibir una llamada de la policía para informarle que Clara fue encontrada muerta, brutalmente asesinada. Temiendo que ambas muertes pudieran haber estado relacionadas de alguna manera, el señor Entwhistle no duda en llamar a su vieja amiga Hercule Poirot para preguntarle su opinión. Y Poirot, alentado por este desafío que se le ha presentado, acepta con gusto involucrarse en el tema. La historia, narrada a buen ritmo, resulta ser muy entretenida, con personajes bien dibujados y un desenlace bastante inesperado. De hecho, Sophie Hannah declara en la Introducción: “Después del funeral tiene una trama brillante, pistas meticulosamente sembradas, una familia memorable y disfuncional en su centro, y una solución verdaderamente ingeniosa …” Puede agregarse a todo esto que la historia tiene una estructura perfecta y que, como de costumbre, Agatha Christie tiene el talento para desviar la atención de sus lectores, con pistas falsas, mientras que, al mismo tiempo, juega limpio al proporcionar toda la información necesaria para resolver el caso. También vale la pena mencionar que la historia recoge los cambios sociales y económicos que se estaban produciendo en Inglaterra en el período de posguerra. Con todo esto, creo sinceramente que me apresuré en mi evaluación previa de este libro y, después de reflexionar sobre ello, no dudo en recomendarlo insistentemente como una de las mejores novelas de Poirot.